This mobile application demonstrates how to retrieve XML data from a server, return the results, and work with the data objects and display them. There will be a video posted on this blog post very shortly with the instructions for building it along with best practices. In the meantime, you may download the source code directly from http://www.web2open.org/adc/XMLService.fxp (On a PC, right click and select "Save link as..."; on a MAC, control-click and select "Save link as..."). Now for some words of caution. First, loading XML into a mobile application is generally a bad idea. It is far better to use AMF with a 3-tier architecture (hello LiveCycle Data Services!!). Nevertheless, small XML files can be worked with in this manner! Enjoy. the Suggested Upper Merged Ontology (SUMO). I also wrote the forward for this book and thought I would share it via this blog. 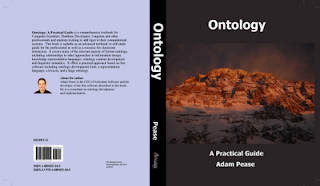 This is a great practical guide to applied ontology projects. Click on the book to see the TOC and to purchase! wanting to take an alternative route for the forward. specific metadata dictionaries or lexicons. who inevitably ended up dealing with the meaning of some XML dialect. the formal modeling work using an upper ontology. work with common software applications such as Acrobat and Photoshop. meaningful work. SUMO provides order for one level of our chaos. other applications that can embrace it. compliments for the book. This is going to be short by contrast! start relating everything to ontological terms. My final word? If you are interested in this subject matter, you owe it to yourself to pick up a copy of the book and consider the sheer genius of Adam Pease. You will not be disappointed.